Good tidings to all! The Kreationists are back after a short and turkey-addled respite. This week brings you, the devoted web-drone, a substantial helping of poetry for your mind, body, and soul. Her name is Hattie Weyland, and boy can she string those words together! 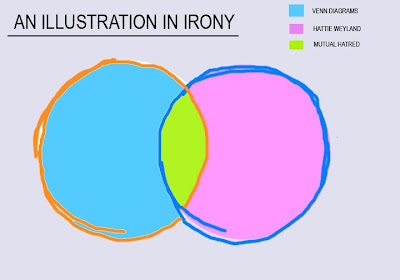 A younger but nevertheless crucial member of the Korner, Weyland's latest lament details her various struggles with that most deceptively simple of mathematical devices -- the Venn Diagram. Of her poem, Weyland comments that the seemingly innocuous diagram represents a larger struggle against "that which is of The Man, and which fancies our suppression." It has been noted that Weyland's interesting linguistic style is in reaction to her current high school environs. So, it is with great pleasure that I present Hattie Weyland's debut publication, in all its bloggy goodness! through my sadly scribbled scrawl. I'd abort all until all could be dead. to rid the world of the two-circled evil.